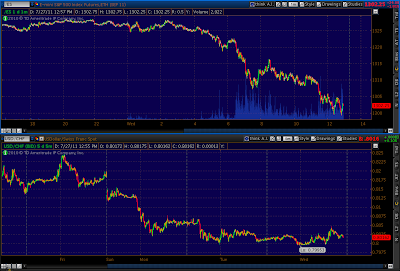 Here’s the dollar vs stocks graph we’ve been watching. As we discussed, the dollar seems to have found its footing, while capitulation has officially arrived in the stock market. 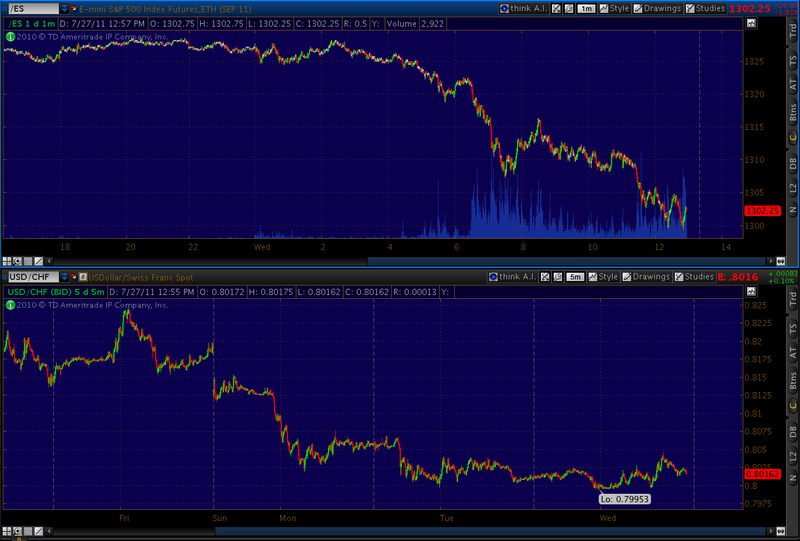 Forgot to mention the Head and Shoulders patterns we discussed yesterday. VIX hit 22.53, obviously beyond our target of 21.68. SPX also beat its target of 1313 and E-minis got to 1302.75, just beyond our 1303 target. H&S; patterns have been very effective throughout this topping pattern. They warrant a close watch. 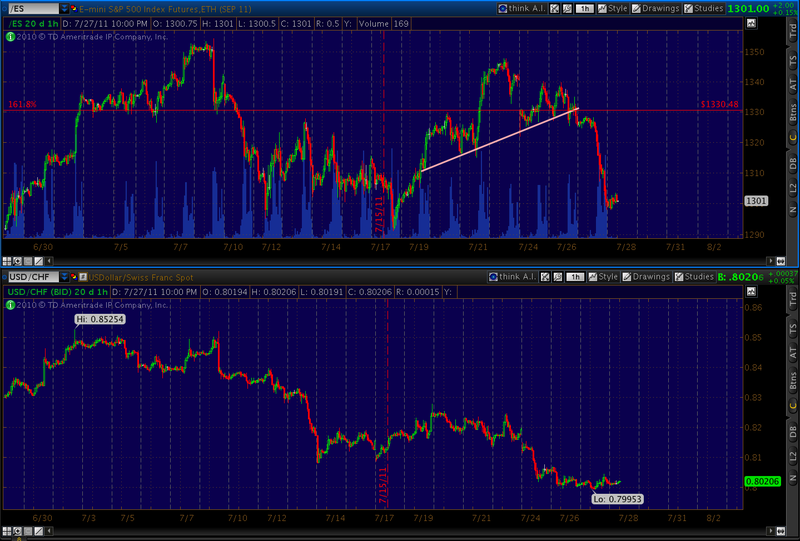 If we blow through the 1307 level, the next stop is 1301.65. Either is good in terms of completing the bullish bat pattern discussed below. Getting this out a little later than usual this morning…pretty interesting day so far. I hope everyone has been able to take advantage of the information in last night’s post. The 2011=2007 pattern continues to play out nicely, as today is a dead ringer for December 31, 2007. The market sliced through the 10 and 20-day moving averages, and bounced at the 50-day as expected. BTW, I’ll often post quick thoughts on Daneric’s Elliott Wave blog. Dan runs a fantastic site, populated by (mostly) thoughtful and knowledgeable investors. I highly recommend it. Durable goods orders came in at -2.1% versus the +0 .5% that the establishment expected. This, along with the latest housing and employment figures, supports my belief that we never left the initial recession — which is now about to get much, much worse. For more, see Thinking, Hoping, Praying. 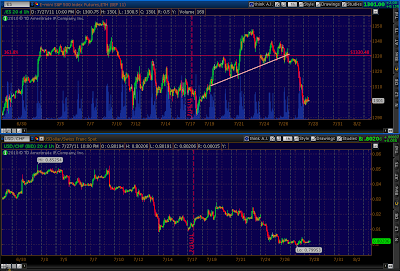 Our next bounce should be 1307ish. It marks horizontal support, as well as the completion of a bullish bat pattern began on the 18th. Normally, we’d look for a bounce back up towards 1320-1327, but I won’t be surprised if this one is only good for 1315 and a quick reversal.